At first glance it may appear that not much is happening in U.S. equity markets. The Russell 1000 Index which tracks the largest companies returned only 3.7% for the first seven months of the year. A lacklustre return no doubt but perhaps appropriate in light of the disappointing U.S. economic performance and muted earnings growth seen so far this year. However, as we dig beneath the surface we find a large divergence between the performance of growth stocks and value stocks. The Russell 1000 Growth Index has returned 7.5% year-to-date, more than doubling the performance of the broader market. Meanwhile, the Russell 1000 Value Index has actually declined 0.2%. The difference in performance between these two groups of stocks amounts to 766 basis points over the seven month period, a relatively large spread between these two indices since data is available going back to 1992. The diverging performance between growth and value stocks is not just limited to the large caps. A similar trend is occurring among small and mid-cap stocks as well. Investing styles go in and out of favour just like any other facet of the markets. The "value" style of investing – buying companies that look cheap relative to their fundamentals, such as earnings, book value or cash flow – has underperformed ever since the U.S. credit bubble began to burst in 2007. Meanwhile, the "growth" style of investing – buying companies that exhibit above-average growth regardless of valuation – has outperformed the broader market returns. Over the 8-year period ending July 31, 2015, the Russell 1000 Growth Index generated an annualized return of 9.0% while the Russell 1000 Value Index lagged behind with an annualized return of 5.4%. Essentially, growth stocks have outperformed value stocks by approximately 3.6% per year over the past 8 years. The degree of outperformance has certainly widened over the past year with the Russell 1000 Growth Index up 16.1% while the Russell 1000 Value Index is only up 6.4% amounting to a spread of 968 basis points for the one-year period ending July 31, 2015. Some of the difference in performance can certainly be attributed to a relative underweight in top performing health care and technology industries across the value stock landscape. Another major contributor that is supporting growth stock outperformance is the sub-par economic growth seen in the U.S. Over the last 8 calendar years (2007 to 2014), U.S. GDP growth has generally remained below 2.5%, with the 5-year average close to 2.2%. During the previous six decades U.S. economic growth was typically well above 3%. Even 2015 GDP growth is coming in weaker than expected due to lousy weather, a stronger U.S. dollar and falling energy prices. All of these factors are joining forces to create a very difficult environment for corporate earnings growth. 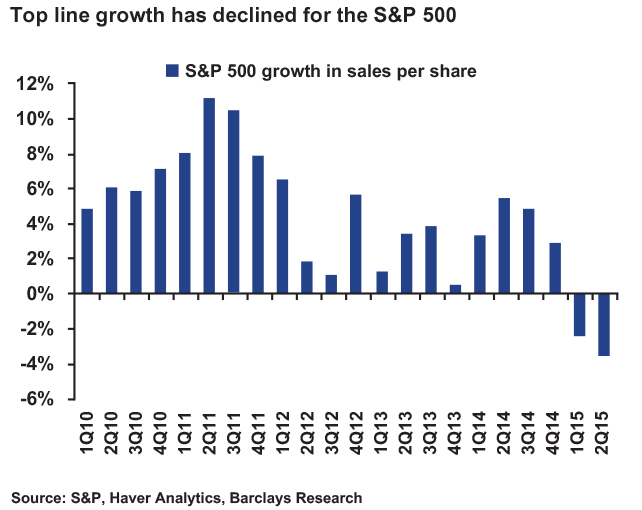 The first quarter of 2015 was the first quarter of negative sales growth for the S&P 500 since the financial crisis. Q2 of 2015 is expected to be worse and for the full year the S&P 500 is expected to show virtually no earnings growth. As growth has become scarce, the stocks of companies with high revenue growth are in demand. As investors flock to these higher-growth companies (and generally away from the value stocks), the performance divergence continues while also expanding the relative valuation difference between the two groups of stocks. 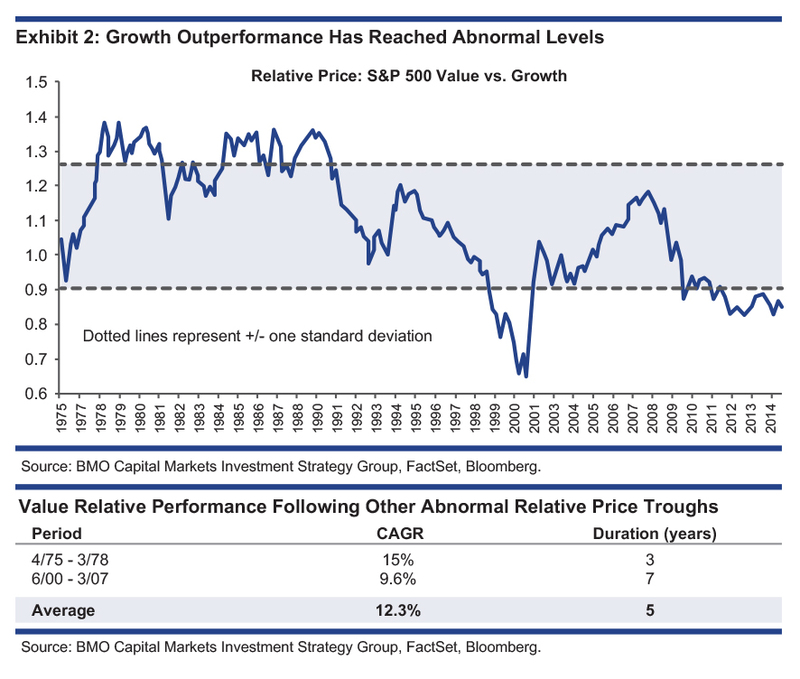 In a recent research note, BMO Capital Markets’ Chief Investment Strategist Brian Belski wrote "there have been only two other times where the relative price of value versus growth was at such abnormally low levels (1975 and 2000). Following such depressed levels, value embarked on a prolonged period of outperformance following both periods." Belski also makes the case that higher interest rates and an improving economy will ultimately be beneficial for value stocks. "The relative performance of value has been highly correlated with the direction of interest rates over the past decade. More specifically, as rates have declined, value has underperformed. This makes sense to us because our work shows that more stable and mature companies – a common characteristic of value stocks – are better able to fundamentally withstand higher interest rates while growth stocks tend to perform better in low or declining rate environments. Thus, we believe value will benefit from the expected long and gradual march higher for rates in the coming years". Value investing will also benefit as an improving economy will make growth more plentiful and investors will likely generate the best returns by owning the most inexpensive names. As profits start to improve growth becomes a plentiful commodity, while value looks rarer. The rising tide should help raise all boats, but as value stocks are cheaper, they typically perform better. Aside from offering potentially better returns over the next few years, we also believe value stocks currently offer better downside protection as well. Market preference for growth stocks over value stocks has widened the valuation discrepancy between the two groups. The fastest growing companies usually trade at a higher price-to-earnings multiple than the S&P 500, but the gap is wider than normal currently. Many growth stocks look very expensive and are prone to pullback. Many of these popular names are burdened with unrealistic upside expectations and any disappointment in news or earnings could lead to a sell-off. Meanwhile, most value stocks already discount a lot of bad news and the low valuation multiples should help protect them from much further downside. Interestingly, the last time growth outperformed value (prior to the current cycle which began in 2007) by such a wide margin it was in 1999 during the tech bubble. While not directly comparable to current conditions, the resilience of value stocks during the subsequent market correction is notable. After peaking in March 2000, the broad market Russell 3000 Index declined 22.0% over the subsequent year. The growth stocks within the Russell 3000 dropped a whopping 42.4% over the same period. Meanwhile, the value stocks managed to eke out a small gain of 1.9%. If you would like to take advantage of the impending shift of investment style in favor of value stocks, consider an investment in Norrep US Dividend Plus Class. It is a core fund that offers exposure to U.S. dividend-paying companies of all sizes. It is managed using a strict value discipline using quantitative screening and fundamental analysis to filter through thousands of stocks to construct a concentrated portfolio of our best ideas. The portfolio exhibits very attractive value characteristics with a dividend yield of 2.9% and a price to earnings ratio of 14.6, which compare very favorably relative to the broad market and the vast majority of our peers. We believe the eventual shift back to value investing will provide a strong tailwind supporting the Fund’s performance for many years to come.